Last year, I posted a picture of the cake I make almost every year for my younger sister's birthday. This year, I remembered to bring my camera in order to take a picture of the cake as served. 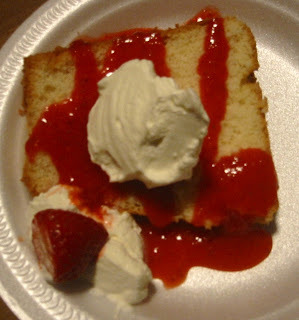 Pictured is Sunshine Chiffon Cake with a strawberry coulis, fresh whipped cream and fresh strawberry. Cake styled by the birthday girl.